The first thing I baked for the Something Sweet challenge was a loaf of apple and spice bread. Well, the bread maker baked it so I cannot take any credit. 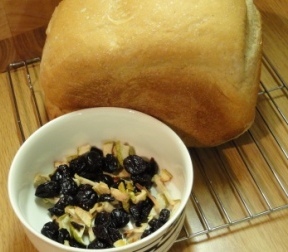 Unfortunately the apples and sour cherries did not get dispensed but the bread is lovely as it is with some cheese. This recipe called for sultanas but I really do not like them when they are cooked and end up being soft. I tend to pick them out of savoury dishes when I can see them. I much prefer cranberries or sour cherries if I can find them. wish you could come over and taste it!